Previous Article Rangers v Villarreal: Forget mathematics, just win! If there's one thing worse than these modern two week international breaks, it's losing the game immediately before it. Fortunately, in our last game against Motherwell, not only did we win, we routed the Lanarkshire side 7-1 so, despite the fortnight's holiday since, confidence should remain high in the Rangers camp. And, given this week's return to SPFL action is against Livingston who beat us a couple of months back, what better way to start a run of 11 games in 35 days than with another decisive Ibrox victory? Of course, despite our excellent home form this season, it's not always as simple as that. First and foremost, Livi deserve a lot of credit for their campaign so far. Yes, their style may not be easy on the eye from time to time; yes, their artificial pitch is very poor, and, yes, they may have dropped down the table since we last played them but to come up from the Championship and do so well after losing two managers since then, says a lot about the character and belief in their squad. 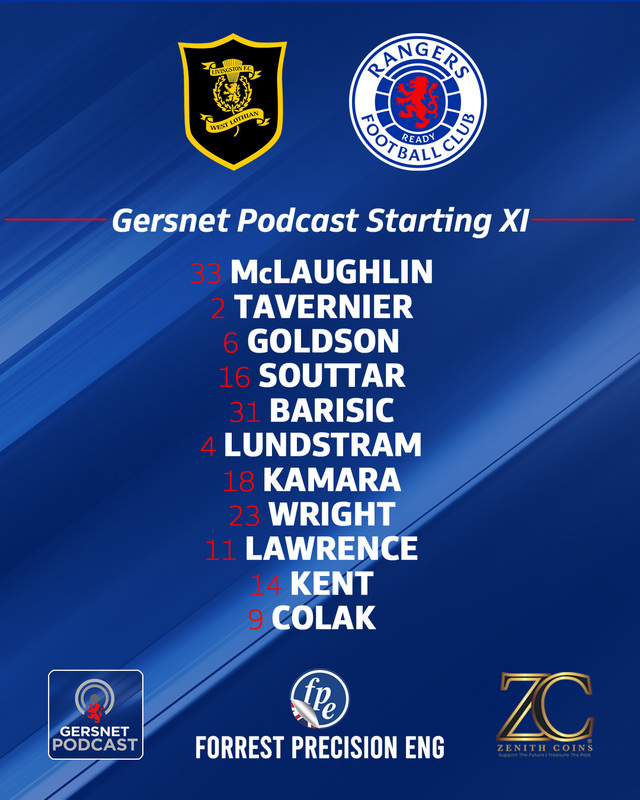 Defensively they are very good (with former 'Gers Liam Kelly and Craig Halkett leading the way) but they're also well organised in midfield and work hard throughout the rest of the team to not only concede few goals but to take any chances they do get in attack. As such, Saturday's match is by no means a foregone conclusion and it's unlikely we'll see another seven home goals. The good news for Rangers fans is that since that last league defeat in West Lothian, we've only dropped two points in the league and, despite some indifferent form, have climbed the table ourselves back into third place just two points behind Celtic and Hearts. Moreover, with almost a full squad of players at his disposal, Steven Gerrard will be keen to consolidate and improve upon that position over the winter period. Indeed, with Celtic at Ibrox in five weeks time ahead of the winter break, how good would it be to go into that game, knowing a victory would take (or even keep) us top of the league? Obviously there's a lot of football to be played before that match and Rangers have a hugely demanding run of games. Not only do we still have two vital Europa League games left which could see us progress from our section against what seemed unlikely odds, we have nine league fixtures to complete: including two against Hibs as well as matches versus Hearts and Aberdeen before Celtic visit at the end of the year. It couldn't get any tougher really and we'll see exactly what our players (and manager actually) are made of physically and mentally during the rest of 2018. In that sense, our inconsistency this season has perhaps been understandable. Wholesale changes - not just in our playing squad but in the management/coaching team - means patience has to be a byword for, well, often impatient fans. Of course dropping points against teams like Livi or Killie the other week is disappointing but neither do we have the right to win every game and play well also. With that in mind, the chances of us winning every game between now and the start of 2019 are rather low so whilst we rightly demand the best, it's important we remain behind the team and manager no matter what happens going forward. That's not to excuse bad performance just to understand we have to be realistic in terms of the bigger picture. Even so, realism tells us we should win this weekend. Although these breaks are never good for squad continuity it will have allowed Gerrard and his players time to work on their play and those two weeks will be invaluable as we go into a period of games where rest and recovery will be just as important as actual training. As such, this will mean every player playing their part given it will be impossible to play the same team in every game on this run. This Saturday though demands three points so Gerrard will be keen to play a strong team even if he'll be tempted to keep some players back for the visit of Villarreal on Thursday night. As such, I'd expect an XI along the lines below to start this Saturday. Aside from any likely changes in defence, the way we cleverly handled a physical Motherwell side, should allow for the same attacking players to get the job done against Livi though niggles for the likes of Middleton may now permit that. Luckily, it says a lot about our squad that guys like Middleton, Lafferty, Katic and Barisic (who could be a key player if he can stay fit) may not start this weekend. Indeed, for the first time in a long time, we could easily start a second XI to do the business in most SPFL games so every player should consider themselves capable of getting into the team at some point. Such competition for places will go a long way to deal with the schedule and deliver the kind of points tally required to offer a genuine title challenge. Is talk of a such a challenge realistic? Perhaps not, perhaps it's too ambitious and certainly premature given the discussion above but at some point we need to believe again and there's no time like the present.